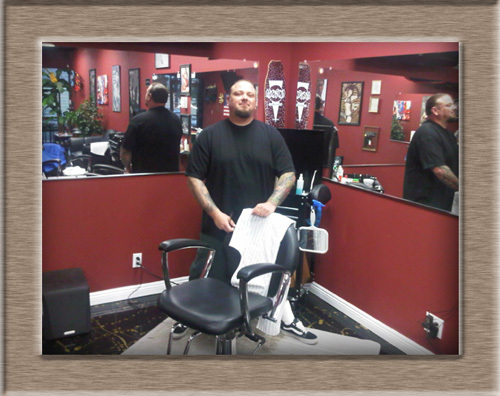 Opened this year of 2010, Cuts and Glory Barber Shop has been a dream of owner Rob D's since he can remember. Always someday he knew he'd have a barber shop. Brought up in the Old School style of hot rods, tattoos and vintage style, his dream has become a reality, and his barbers was opened after many years of scouting locations, getting permits, construction and other setbacks. But finally he's opened the doors, and can provide the service and quality haircuts and styles he himself recieved at the barber shops where he had his haircuts as a youth. With 2 chairs, there may be a bit of a wait, but it's well worth it and you can play pool or have a cold drink or watch some sports on the LCD TV above the chairs. Rob is a friendly guy who likes to make sure you get exactly what you want. Come on down and walk in and relax at the coolest barber shop. You're next.